Do you love the look of natural materials and lush tile, but need a flooring option that’s more resilient and budget-friendly? Consider luxury vinyl flooring. With major advancements in vinyl production and printing technology, luxury vinyl flooring has the ability to closely simulate natural materials that matches hardwood, ceramic tile, and natural stone options in terms of design, durability, value, and practicality. Possibilities, possibilities, possibilities: When it comes to luxury vinyl, the design options are almost endless because luxury vinyl flooring is nearly indistinguishable from materials it is mimicking. And, with so much variety, you don’t have to compromise on style. But, why do luxury vinyl floors look so convincingly real? One reason for luxury vinyl's beauty is because it is made using high-definition imaging during manufacturing. This process creates tiles that are realistic-looking and accurate. Also, because luxury vinyl comes in various levels of gloss, you can achieve a wide range of looks with this flooring choice. It's so convincing that you'll have to look twice to see that it's vinyl flooring. Luxury vinyl holds up well to any spills that might stain other traditional materials. With the exception of the seams, it’s essentially waterproof. And, if it can’t soak in, it can’t mildew and stain. Do you need a flooring choice that doesn’t require a lot of upkeep? With luxury vinyl, there’s little maintenance. With a bit of occasional sweeping and damp mopping, it will continue to look fantastic year after year because luxury vinyl flooring is designed to be tough and sturdy, even in homes with a lot of traffic. Have pets? No problem. 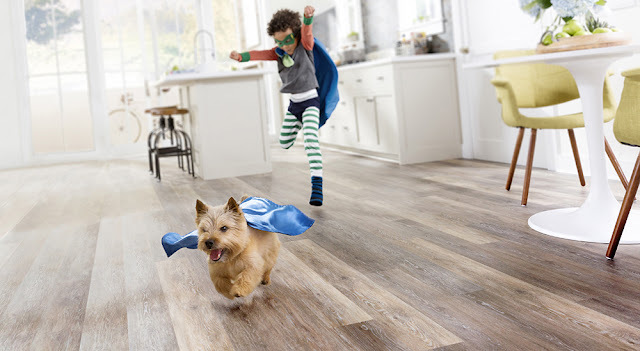 Luxury vinyl flooring was strategically designed to be pet-friendly, and many feature claw-shield coating to damage and scratches. Luxury vinyl is durable, low maintenance, and easy on the budget. It’s no wonder that it’s most popular type of resilient flooring. Luxury vinyl is the perfect combination of style and affordability because its price is just a fraction of what you would have to pay for the real thing. 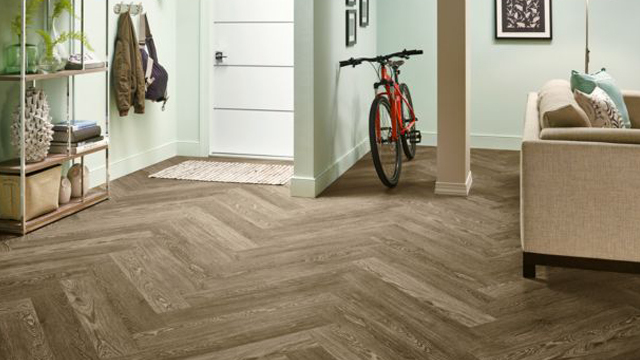 With this flooring, you can get the look you want without breaking the bank. Luxury vinyl can go in any room of your home because it’s tough as nails. It doesn't easily stain, fade, dent, or scratch. With appropriate preparation, luxury vinyl can be installed over virtually any clean, flat, and dry surface and it’s an especially good choice for areas with high-traffic or lots of moisture. It is available in planks, sheets, and tiles. Planks have naturalistic features, including texturing and beveled edges. Sheets typically come in 6- or 12-foot-wide rolls which means they can often be installed seamlessly. Tiles are a great choice if you’re interested in a grouted look for a more true-to-life stone or tile appearance. When you choose luxury vinyl for your floors, it’s possible to get high-fashion and high-performance that’s both practical and affordable. Whether you want a stone-look (such as slate, marble, or travertine) or a wood-luck (such as teak, pine, walnut, or maple), there are luxury vinyl flooring options that can convincingly simulate them all in a variety of colors, styles, textures (including smooth and hand-scraped), and qualities.